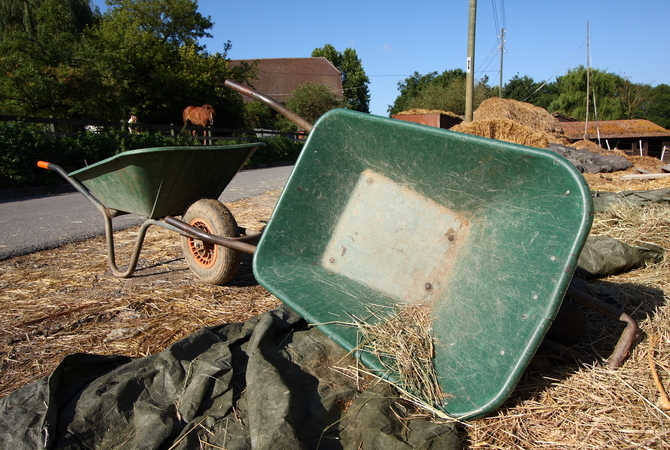 Keeping horse stalls mucked and clean with wheelbarrow and helpful tools. Taking care of a horse does not need to be overwhelming, nor need it be so time-consuming that it takes the entire day. A good approach to take is to determine what things must be done on a daily basis a weekly basis or a monthly basis. Owning and caring for a horse is hard work, especially if your horse is housed on your property. Falling behind in your daily chores can lead to unsanitary or unsafe conditions, so it is important to keep up with the daily tasks. For many horse owners, time spent in the barn is therapeutic and an enjoyable part of horse ownership. For others, the work required is more than time allows. For many, stabling the horse in a commercial barn where the basics are taken care of by staff is a better approach. For those of you who choose to take hands-on responsibility for the daily horse care, here are the basic tasks that you should consider. These tasks should be done on a daily basis. These tasks are important, but should be performed based on local conditions and the advice of your veterinarian. In the long run, periodic and preventative health care will save you money and save your horse from suffering from preventable diseases and conditions. Basic repairs to fencing, doors, stall mats and more - it never ends! Take the time during your daily chores to approach your horse for nothing more than a pet or to give a treat. This little activity will make your horse easy to catch when you want to go riding. Horses are herd animals, and are most comfortable when in a herd setting. Allowing horses physical contact with each other in a herd environment may reduce stereotypical behaviors, and reduce stress related conditions, including ulcers.